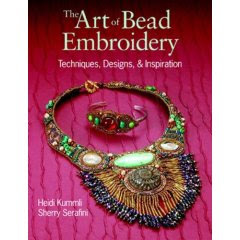 I received my copy of The Art of Bead Embroidery, co-written by Heidi Kummli and Sherry Serafini, and I just immediately fell right into it. Honestly, I did not learn as much from this book as I have from several other embroidery books, but it was highly inspiring. I was intrigued by how much variation in looks can be achieved by the use of only a few different stitches. I was also inspired to think about adding fringe to some of my pieces…ok, well, probably not. I love the way Heidi and Sherry’s pieces look with all the fringe, but I am just not a fringe type of girl. I add fringe to almost nothing, and it’s pretty likely to stay that way. But boy, is it ever pretty!